There are a great number of debates on this subject already, and I could agree with any of the first 10 hits in a Google search of “wordpress vs tumblr” for either side, as there are certainly advantages and disadvantages to each. Here is my take. Overall: WordPress is more powerful but more bulky; Tumblr is more simple but more limited. (Also, I’m referring in this post to WordPress.com hosted WordPress. If you don’t know what I meant by that, ignore it.) Feature sets are as of mid-2010. When you create a Tumblr, you can basically start blogging immediately, with little adapt-time. On your Dashboard, you click this giant button for Text Post and it leads you to a nice, basic text editor. You type in a couple messages, click Create Post, and in no time you’ve created your first post! You’ll find, however, that what I listed above is about all you can do. There are slight variations, such as posting pictures, quotes, audio, and short videos, (and a little more, but are all expected of a blogging software) but that’s it. Going further, you can “follow” other people so their posts will show up on your Dashboard, very similarly to friends’ statuses in Facebook’s “News Feed.” After that, you can “like” posts, also similar to Facebook, and you can “reblog,” which basically copies a post into your own post and lets you comment or reply to it. Your response, however, will only appear on your own blog. This makes Tumblr a poor choice for discussion—there is NO built-in comment system. For me, that alone made Tumblr out of the question. When you create a WordPress, things are different. On your Dashboard, you see a zillion things on the left-hand menu, and a perhaps-intimidating grid of information in the center. In fact, it might not be obvious at first how to make your first post! After a little while of getting used to it, however, you find that it virtually lets you do anything you want. You can include almost anything in posts. You can put categories or tags on your posts, for archival purposes or for ease of access. Speaking of archives, Tumblr’s post archiving system is unique, but rather disorganized—it looks nice, but it’s incredibly hard to find a certain kind of post. On WordPress, if you can narrow down the category or month, it can become much easier. You can also comment, which makes WordPress infinitely better for discussion; it has automatically included anti-spam as well. WordPress comes with a built-in stat tracking system, which is very nice, telling you how many times posts were viewed, which ones, from what links, etc. It also LOOKS more professional. The themes are very well designed, and there are lots of them. You can post attachments which don’t have to appear in any post. Plus, WordPress is de facto more than just blogging—it lets you create a website, with pages which are not posts, and which can be as many in number and can have as many sub-pages as needed. And each of these features is customizable. It might seem above that I am saying that WordPress is unequivocally better. But that is is not my point. Whether you should choose WordPress or Tumblr (assuming you have narrowed down your choice of blog to these two, though there ARE other nice blogging sites) will depend on how you plan to use your blog. If you want your audience to be a group of close friends, and you don’t feel too serious about blogging, then I would recommend Tumblr, as it’s easy to set up, easy to connect. But if you want to reach out to a world audience, and are somewhat serious about blogging, then I urge you to use WordPress. It takes more time to get used to, but it gives you so many more features. 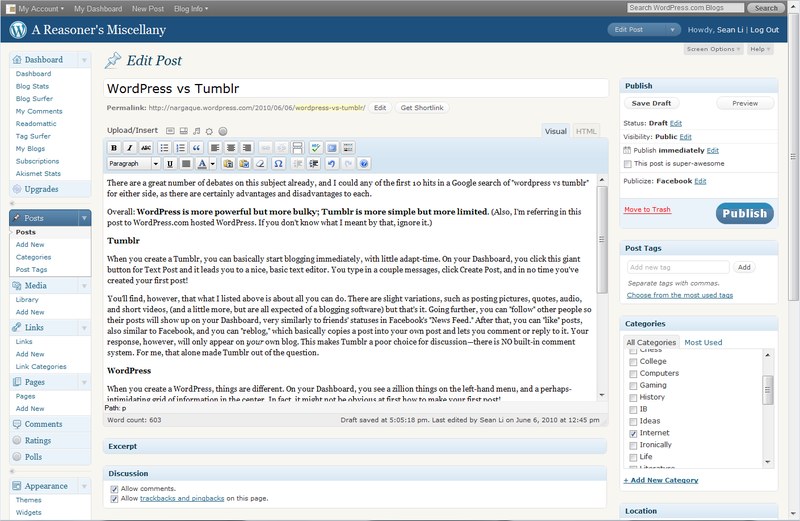 Here are a screenshot of Tumblr and of WordPress respectively. Click an image to view at full size. That’s a heck of a lot more customization, but also a heck of a lot more to learn. You’ve seen them, you decide. Haven’t tried it, but from initial research I found that Posterous is relatively new and right now still lacks the basic feature set of a blogging software. If it “deserves” to be in the debate, we might as well add LiveJournal, TypePad, Blogger, etc. Plus, this post was intended to be purely a Tumblr vs WordPress debate, as someone earlier today was talking about creating a Tumblr/WordPress. I appreciate the recommendation though—I’ll check it out. Good point re other blogging platforms to include. That said, Posterous and Tumblr seem to have leapfrogged the others with tighter social media integration and a steady, if not spectacular, pace of improvements. I can’t seem to comment on my friend’s Tumblr blogs. Anyone can comment on my WordPress blog. Do you really have to be a member of Tumblr JUST to comment on their blogs?!! Yes, I believe so! I know there is a third-party app for Tumblr that allows comments to be posted the normal way, but I don’t know if you have to be a member of Tumblr to post comments using that app. Even so, your friend first has to have the app (it’s called DISQUS I believe), and have privacy settings set so that a non-Tumblr member can access the blog. In that respect, WordPress wins too in simplicity. I like tumblr I just wish their text editor was a bit better. Whenever I try to center something it never works out well. WordPress I haven’t used I may look in to it now, thanks for this review. I’ve had a self hosted WordPress blog for quite some time. Recently, I haven’t been blogging much over on my technology/photography/coffee/life self hosted WordPress blog, Island in the Net. I’m not quite sure but I think it has something to do with the amount of effort involved. It seems like every week I’m updating a plugin, tweaking a setting, or some other lengthy maintenance task. I’m seriously considering switching to Tumblr or Posterous. Tumblr beats Posterous in terms of community and theme selection but Posterous handles multimedia much better. Wish I could combine the two. Interesting, thanks for posting! I’m using a WordPress.com-hosted blog (well, obviously), and it updates automatically without my having to install anything. I haven’t tried a self-hosted WP yet, but if it has that much maintenance, I can see why anyone would choose against it. I do like the WordPress.com-hosted version though. I notice this article does not mention mobile blogging at all…I do most of my posts from an Android app. That seems to be when I am most inspired to make contributions to my blog. Tumblr has great mobile integration. Very good point, Steven. As someone who seldom uses phones, I concede I know almost nothing about mobile blogging. So I’ll trust your opinion on this. I’ve used all the major blogging platforms over the last few years – sometimes simulateously – WordPress, Blogger, Posterous, Tumblr, LiveJournal, MoveableType, and various others. I’ve pretty much settled on four main platforms; Twitter for the short stuff, Tumblr for longer random stuff, WordPress for the full-on Blog, and Facebook for family and friends. i’ve tried WordPress and although it seems more powerful, there wasn’t anything very appealing to me…. i found the features quite boring and i didn’t like any of the backgrounds/themes. Tumblr had tons of gorgeous themes, so i really liked that… and there lots of professional photography blogs and all that. i settled on Tumblr, and i deleted my WordPress. not saying WordPress is bad, but to me, Tumblr works better. of course, everyone has their own opinions, so everybody feel free to state what they think…. 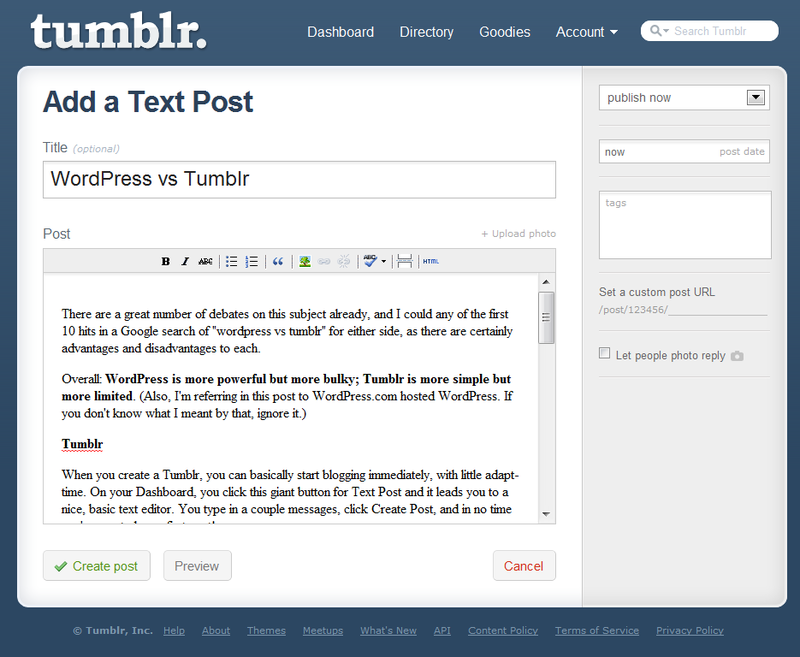 There’s always the option to embed your tumblr into your wordpress blog. So it’s the best of both worlds. Although, I use wordpress exclusively, because it has more features for my music – i love it! Good discussion. Thanks for the information. Now I need to make a decision! WordPress.com + Twitter is the best free combination. Use Feedburner (or equivalent) to auto-tweet new WordPress posts and add the Twitter widget on your WordPress. Twitter – Microblogging at its best for quick comments, opinions and thoughts. Extremely mobile too. WordPress – For lengthy articles that require explanations and understanding. In my opinion simplicity wins ALL the time. Features are cool, but if you want something to be published, it’s got to be easy and fast. The total amount of time spent customizing is worth nothing according to the average lifespan of actual interest in webnews. I switched from blogger to wp, because I wanted to get rid of thad google-blog, and wp is the best alternative. But, in the end, mailposting or minute-long customizing is no longer state-of-the-art. So, I consider about switching completely to Tumblr, even though that you have to have an account only in order to post comments seems a complete bulls** to me. it depends on your theme like coraline and twenty ten you can change the out look upside down.In paid domain you can edit css and do what ever with your blog. this analysis shows tumblr is for kids and word press for experienced persons . Is it liked that ? Want to maintain a whole business website? WordPress (self-hosted). Want all the above, but too busy or lazy. Stick to Facebook. Allow me to disagree that tumblr is not for professional blogging (although I do not do that). As mentioned each platform had prons and cons. Recently I switched one of my blogs to tumblr because I knew I did not have to write lengthy posts. Somehow, wordpress is connected to lengthy and serious post, which sometimes results negative in writing and posting. Was curious about Tumblr, didn’t want to sign up to see… and well, guess we know it now. Tumblr should integrate twitter accounts though. Maybe the latest x updates in the sidebar, or something of that sort. can you do this in tumblr like you can in wordpress? any suggestions for a self employed photographer? I think WordPress is better for SEO optimization, but this might not be so important in the long run. When you get popular, you’ll be getting lots of pageviews from social networking sites and explicit links, not as much from search engines. So choose your pick, I would go with what looks better for your photos. When I first heard of wordpress, I was also looking at starting a tumblr. I am SO glad I picked to blog here instead, because it seems like tumblr is very much like facebook, which I already had. I agree wholly on the discussion aspect too. I would hate not being able to see other’s comments on my posts. Both of them are nice, but I personally prefer Gsick, I love it’s minimalistic philosophy and it’s unlimited channels! all same unique. but, which we choose?.. wp: simple, faster, and we can better ’cause critic and suggestion. tumblr: I don’t know ’cause i don’t use tumblr. but, i’ve visited some tumblr blog. there are much beautiful photos and animations. You’ve convinced to give Tumblr a try, after using WordPress for some time. Question though, is it feasible to try both concurrently to see which elicits better feedback, engagement, etc.? Do many bloggers utilized multiple blogging platforms? Yesterday i tried tumblr… and I can’t say that I liked it… WordPress is really much better! I am actually thinking to switch to tumblr.. Should I? go over insights and beliefs, and even generate leads towards corporations that master its use.